If you really need a car, your first thought may be to apply for a car loan. That is if you don’t have enough cash on hand. This is a solid option for some, but what if your credit is bad? Your chances of getting approved for a car loan rely heavily on your credit score. If you have a good credit score, usually 650 and up, you’ll be looked at as someone who’s a lower risk to lenders. If your credit is bad or you don’t have any credit history, it will definitely deter your chances of getting a car loan. However, it doesn’t mean that all hope is lost. Here are some ways to get a car loan when you have bad credit. The first thing you need to do is check your credit and see where it stands. You may believe that your credit is too bad to get a car loan but you still might qualify. According to https://www.britanniacarfinance.co.uk/personal-lease-cars, the average credit score needed to buy a new car is 714 and 655 for a used car. Yet, it’s still possible to obtain a car loan with a lower score. Your interest rate will just be higher. Bankrate reports that a score of 500 or below is going to get you an interest rate of anywhere from 13% – 18%. This is pretty high, so you’ll have to consider if the payment and term is within your budget. If you don’t want to have such a high interest rate on your car loan, you could take some time to improve your credit score before you apply for a loan. You can go to AnnualCreditReport.com to view your full credit report and use free services like CreditSesame to monitor your score. For example, if you know that your current car is going to be on its last leg soon, you can start working on improving your credit score and saving up some money. Going directly to a credit union or bank may be a better option if you’re trying to get a car loan with bad credit. Credit unions generally provide better rates than dealerships. They may even offer you a personal loan at a lower interest rate that you can use to buy the car off the lot. I remember when I first financed my car and I didn’t shop around or explore my options. I was given a loan with a 15.5% interest rate and my credit wasn’t even that bad. When my husband went to finance a car, he did it through his credit union. He got a 5.5% interest rate. I was pretty baffled because his credit score was lower than mine. If you’ve been a loyal customer at your credit union or bank for some time now, you might want to try getting a loan there first. If your credit is really bad and you don’t think you’ll qualify for an auto loan, you can always try to get a cosigner to go on the loan with you. If a parent, friend, or family member is willing to co-sign has good credit and is willing to co-sign your loan, this will greatly improve your chances of approval. It’s important to make sure that your co-signers understand all their rights and responsibilities. If you default on the loan, your co-signer will be responsible for paying it back. Depending on how long your term is, you might want to get an agreement in writing. Make sure it says when you’ll try to refinance your auto loan and drop the cosigner. As long as you pay your monthly bill on-time, you’ll build your credit and increase your score. Buy here pay here lots are different from car dealerships where you finance a car through a private bank or lender and pay them monthly instead. Buy here pay here car lots often cater to borrowers who have bad credit scores. Once you find a car that you want to finance, you make a down payment and pay the lot directly based on the agreed terms. You’ll likely be dealing with a higher interest rate but some lots even charge a flat fee for all borrowers. Ask people you know or local Facebook groups for recommendations of car lots that operate fairly and will be willing to work with borrowers who have less than perfect credit. Another thing you can try is saving up a bigger down payment to obtain an auto loan with reasonable terms. You want to consider a quality used car that doesn’t cost tens of thousands of dollars. By doing this, you won’t have to get locked into a long-term loan. Shorter-term loans tend to have lower interest rates. Plus, when you make a large down payment, it lowers the risk on the lender’s end. They get a nice percentage of the money for the car upfront. There’s no guarantee that having a bigger down payment is going to make a significant difference. That said, it is worth considering for these reasons alone. Plus, you don’t want to drive your credit down even further if you manage to finance a car that is over your budget. Ultimately, it’s going to be more difficult to get a car loan when you have bad credit but it’s not impossible. Try the options mentioned above and work on improving your credit score. This way you don’t run into this issue in the future. 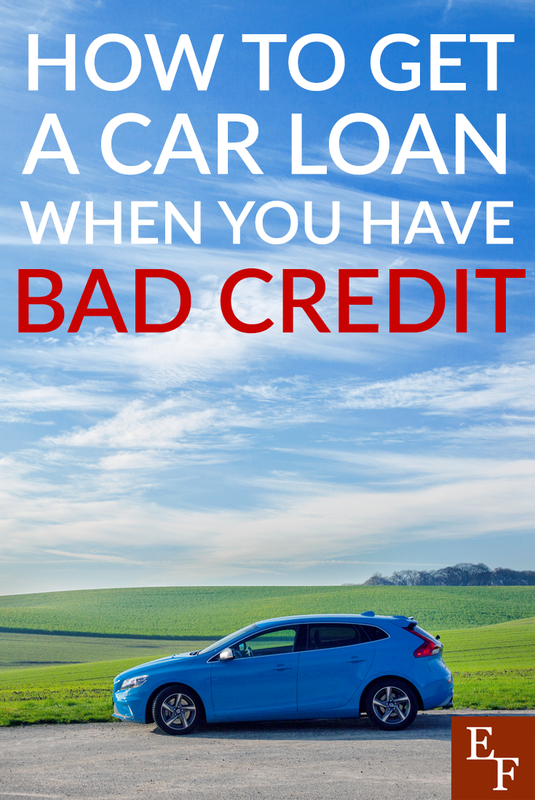 Have you ever tried to get a car loan with bad credit? Which is Better: Leasing a Car or Buying One? The real cost of owning a car on a yearly basis!